Ranked #1 in Australia and 4th in the world for graduate employability. The University of Sydney has again been named the number one university in Australia for graduate employability, a position it has now held for three years running. The 2018 QS Employability Rankings also reveal the University’s graduates are the fourth most sought after in the world, the same position as last year and up from 14th in 2015. In addition to surveying over 30,000 employers, the QS rankings move beyond employment rates and evaluate the affiliations of high-achievers, as well as work placement partnerships and employers’ connections with graduates. “We are delighted by the rankings which confirm our graduates continue to be the most sought-after by employers in Australia and in high demand worldwide,” said Vice-Chancellor and Principal Dr Michael Spence. Workplaces of the 21st Century are under rapid change with technological advancements and an increasingly globalised workforce. The skills our graduates will require to excel in such a workplace are likewise evolving. “This is why we have transformed our undergraduate curriculum with the Sydney Undergraduate Experience. 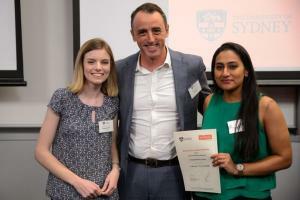 Every University of Sydney student will have the opportunity to take on real-world industry, community, research and entrepreneurship projects,” said Dr Spence. Winners of the Dymocks Challenge Stephanie Ryan (L) and Swetha Das (R) with Dymocks Managing Director Steve Cox. One of the main drivers of the University’s ranking was the networking and partnership opportunities made available to students by employers. A recent event saw students pitch their best ideas to a panel that included entrepreneurs, industry and government. Students have also helped solve real-world challenges for Australia’s largest book retailer Dymocks, while in the faculty of Engineering and IT, students have helped engineering firm Cardno navigate a drone-enabled future. This year, the QS rankings considered 600 universities, double that of last year, and expanded to a top 500 from 200 in 2016. 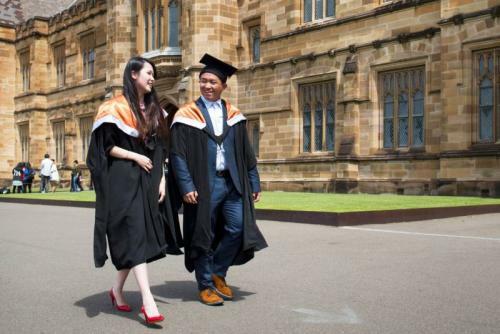 The rankings also increased the number of Australian universities included from 15 to 24. The results follow the recent announcement that the University has been ranked 61 in the world and 3rd in Australia in the latest Times Higher Education World University Rankings. Quacquerelli Symonds (QS) was founded in 1990 and provide a number of higher education rankings including World University Rankings and subject area rankings.